About a month ago, I wrote a post about the Pokemon bookmarks I had started using in my library. 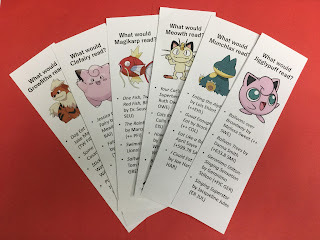 These bookmarks were created as a way to keep kids coming in the library and to teach them about using our catalog to find the books they might like to read. During the month of February, fifty bookmarks were completed and turned in to me. 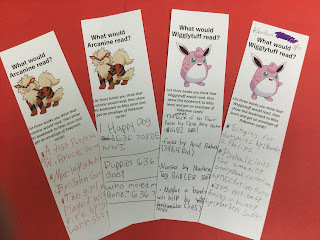 With each bookmark, I read the child's suggestions and then awarded them an envelope of Pokemon cards. We switched out the character on the bookmark every time we ran out of bookmarks. I never once mentioned these bookmarks at Pokemon Club or in front of any group of kids. They learned about them mostly via word of mouth, the signage on our circulation desk, or if they were here alone and bored and came to visit me in my office. 1. Inform the Staff. I made sure my staff knew that the bookmarks existed, sure, but I didn't think to warn them about the number of kids who would be asking about them or who may need assistance locating books to put on their bookmarks. Many of my staff jumped right in and helped out where needed, even giving kids one-on-one lessons on how to use our library's catalog. I enjoyed watching this because it gave our kids a positive interaction with an adult and also empowered them to look up other books later on. 2. Adjust on Programming Days. Yesterday was our monthly LEGO Club. A few of the kids from LEGO club knew about the bookmarks and filled them out before coming to club. Then they walked in with Pokemon cards in their hands, and many of the others wanted to know where they got them. This led to kids leaving LEGO club to fill out a bookmark, which isn't really something I minded. However, we finished up one character's bookmark, which my staff then replaced with a new one. The rule for the bookmarks is that you can only complete each character once, so when some of the kids saw a new bookmark set out, they completed that one, too, and received a second set of cards for the day. There were a couple of ways I could have handled this. I could change the rule to one bookmark per day. I could instruct the staff not to set out a second character on program afternoons. Because it had already happened by the time I noticed yesterday, I told the staff not to put out a third character, even if the second bookmark ran out, and came up with a solution for the next time: On days when I have programming after school, we will set out a large quantity (25 or more) of one character. This way, all children who want to participate can do so, but no one can complete the bookmark twice in a day. It would have been very easy yesterday to get ten children to complete all the bookmarks ad infinitim, and they would have happily cleaned me out of my stock of Pokemon cards. This program has led to many great one-on-one conversations with my young patrons about Pokemon and books, two things I will happily chat about any day. Thanks so much for sharing this awesome activity--My library kids love it! !